As my Baby Boomer contemporaries and I approach retirement, there are several unpleasant facts we face. Most of us have not been able to accumulate significant wealth in our retirement savings accounts, pension plans for public workers are under attack, and Social Security, the most secure component of retirement funding, is threatened. Sadly, younger generations as a whole are no better off, so I’m speaking to you, too. When 401(k) plans burst onto the scene back in the 1980’s, I had no concept of what retirement might be, how to save for it, or how amazingly quickly 30 years would go by. Luckily for me, I benefited from the tax deductions these plans offer, so I maxed out my contributions. But, I didn’t do it because I understood how saving for retirement works. A broad understanding of the retirement-financing problem, a perspective I so desperately lacked early in my career, can come in handy when considering all the individual retirement decisions you’re going to have to make, many long before you reach retirement age. In fact, it’s essential. Without it, you make decisions out of context when, in reality, all of your choices are tightly interrelated. We only earn an income until we reach our mid-sixties or so, but our living expenses continue our entire adult lives. This is the crux of the retirement funding challenge: we earn income only until we retire, but we continue to have expenses until we die. Financing retirement is largely (though not solely) about stretching the income we earn before retirement so we can also meet our spending needs after we retire. In other words, most people approaching retirement today don’t have anywhere near enough savings. And it isn’t just Baby Boomers. If you read the report that inspired the WSJ article, you will find that younger generations are in no better shape. They just have a little more time to fix the problem, though not nearly as much as they think. In the United States, people typically grow into adulthood and then get a job. We work and earn income until, again typically, one of four things happens: we die, we are no longer able to work, we no longer need to work, or we can no longer find suitable employment. The dying part is straightforward. Many people die before approaching retirement age and financing retirement for them is, unfortunately, not an issue. Since we generally have limited warning of our impending death, everyone needs to prepare for retirement and for those of us who will die early, retirement savings efforts will largely go for naught. That can’t be avoided, though we may be able to pass the unspent savings on to our heirs. Some of us will stop working because we are no longer able to work. We may become too feeble, or disabled at any age. Oilfield workers, for example, cannot continue to work in that physically demanding profession beyond a certain age. We may be perfectly healthy but still need to stop working, nevertheless, in order to care for a family member who is not. Some of us will acquire enough wealth to allow us to stop working because we no longer need to. For some people, like Mark Zuckerman, this will come at an early age. For others, it may not happen until our sixties or seventies and, for many, it will never happen. Others will be forced out of work by layoffs, age discrimination and other causes. As we grow older, we find it more and more difficult to find appropriate employment when we lose a job. A recent survey of retirees found that more than half had been forced to retire sooner than they had planned for one reason or another. Should you live long enough to retire, it is difficult to predict when you will be able retire. You might plan to retire at age 66, but will your employer let you work that long? If you lose your job when you are older, will you be able to find another? Will your health hold out to 66? Will family members need your help, forcing you to retire? Will your stock and real estate investments build the wealth you need? Once you retire, your income will typically come from Social Security benefits and your personal retirement savings in 401(k) accounts and IRAs. While you are working, you will pay FICA taxes and the amount of FICA taxes you pay over your career will determine the amount of the Social Security retirement benefits you will receive after you retire. Still, Social Security benefits will replace only about 30% of your pre-retirement income at most. The maximum individual Social Security retirement benefit is a bit more than $30,000 a year in 2012 for an individual retiring at age 66, but the average benefit is only $14,760. A non-working spouse could increase household income 50% above those amounts (from $30,000 to a household maximum just over $45,000, or from an average $14,760 to $22,140). In a two-career household, each spouse could potentially qualify for the maximum household Social Security benefit totaling over $60,000. The rest will need to come from your savings. A key factor in the cost of your retirement is how long you (and perhaps a spouse) will live. You will need more money to pay for a retirement that lasts until you are 95 than to pay for one that only lasts until you are 70. That’s obvious. What might not be so obvious is that you must plan to live to 95 or even older and you must save for retirement as if you will live that long, just in case you do. Some people think they should plan for their average life expectancy, but that is a mistake. By definition, 50% of us will live less than the average life expectancy for our gender and age group and 50% will live longer1. If everyone planned for an average life expectancy, half of us would die broke. Think of it this way. Imagine you needed to cross a desert and would have to carry all the water you would need with you. You are told that, on average, people who have crossed successfully needed 20 gallons of water, but some needed as much as 40 gallons. You would want to take 40 gallons, even though that would probably mean you would have to carry much more than you would actually need, because not having enough water would be catastrophic. Likewise, running out of money in old age could be financially catastrophic. Another factor with a huge impact on financial planning is how we choose to invest our retirement savings and how much we earn on those investments. This complicates an already confusing picture, so I will postpone most of that discussion. Let me simply make the following points on the topic. The more your retirement savings investments earn, the less you need to save before retirement. However, to earn a greater return, you have to take more risk, which means that you are also more likely to lose money and possibly never save enough for retirement. Notice in the diagram above that the personal savings account, or 401(k) box, has an arrow labeled “investment returns” looping back to it. These savings accounts grow two ways, first by savings contributions and then by the investment returns those savings hopefully earn. The emphasis is mine — “never getting there” is a very real possibility, in fact, a commonplace outcome. To summarize, then, we work before we retire and earn Social Security benefits by paying FICA taxes. Hopefully, we can also save additional funds in a retirement savings account. We invest our personal savings in those retirement accounts so they will grow. The amount we need to save depends heavily on the returns we will earn on our investments, but we cannot know what those returns will be in advance. If our investments grow a lot, we will need to save less money than if they don’t. As an example, let’s assume that you believe you need $1M to retire on and that your retirement date is thirty years away. If the market returns an average of 5% annually for the next 30 years, you would need to save $15,000 every year to meet your goal. 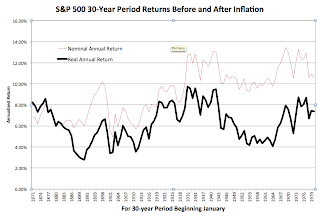 If the market averages 10% annual returns, you would need to save just $6,000 each year. Unfortunately, you can’t predict the market returns over the course of your future working career, so you can’t know the amount of savings that will actually meet your goal. 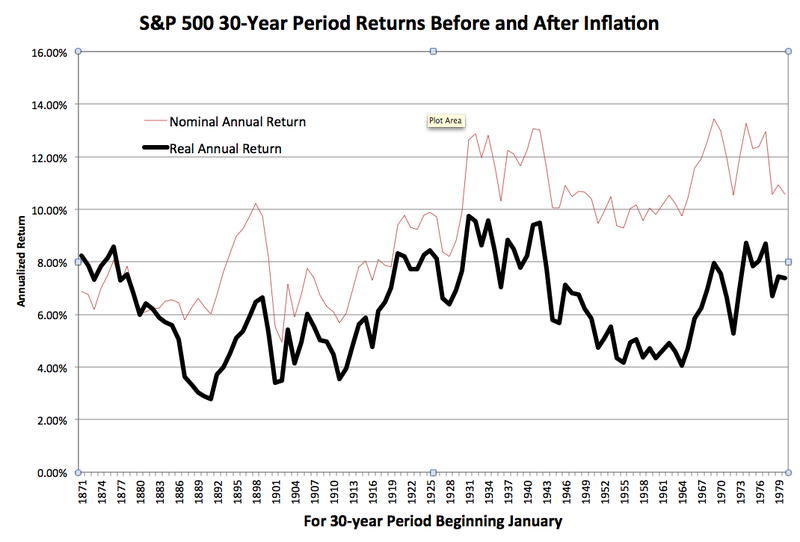 One dollar invested in 1891 and earning market returns could have grown to only $2.28 after inflation over the following 30 years, while a dollar invested in 1931 could have grown to $16.21 adjusted for inflation. This table exposes the problem with planning your finances based on long-term market returns. While the long-term annual return of the U.S. stock market has been around 8% by some calculations, people who began investing in 1891 or 1901 saw nowhere near 8% market growth. And there is certainly no guarantee that you will. This illustrates a fact you may find disturbing. The market returns we get over our lifetimes — the ones that may determine our standard of living in retirement — depend on the accident of our birth dates and they are rarely the average. We don’t know how long we will live or how our investments will perform. Nor can we accurately predict how much we will need to spend a few decades into the future. That makes planning extremely challenging. On the positive side, the answers become clearer the closer we get to retirement, so we can make adjustments over time. This is the basic structure of American retirement financing in 2012. 1 Technically, that’s the definition of median, not mean, but the two are very close in this scenario.